It was announced that many senior personnel changes have taken place. Rob Goldsmith the previous General Manager has been seconded to a MAG confidential project expected to last several years. His replacement is Paul Knight who is well known to the Consultative group as he was the Operations Director. The business development manager has been relocated to Manchester although his mandate still includes the route development for Bournemouth. All staff from senior to junior have multi-tasking roles and the scheme is working well. The General Manager explained that many regional airports are struggling in tough economic times. An expectation exists that Durham Tees and Newquay will not survive much longer. The widening of the Air Passenger Duty announced in the recent Budget is bad news. Serious lobbying continues to have this tax reduced or abolished not only by airport companies, but by Chambers of Commerce as well. The UK is the only group of countries that has such a tax. If a passenger has a return flight between two UK airports then the tax is paid in both directions as the point of departure determines the tax impact. The £2.50 drop off charge will continue for another one year when it will be reviewed again. This topic was raised at the latest ACRA meeting so I asked if comparable charges and levies introduced at other regional airports could be published. It will allow a comparison to be made with Bournemouth. My request was agreed and the information should be available within two weeks. The number of routes this year has increased and the forecast is that air traffic will increase by 5% compared with 2011. Development of the commercial area accessed from Chapel Gate is subject to a public consultation that goes live from 2 April 2012 for 12 weeks. The eco processing site in Chapel Lane has applied to handle food waste and it is opposed by the airport. Safety grounds are quoted as food waste will attract large flocks of birds. This subject gave rise to a number of comments by users of the airport and the commercial area that the present eco composting operation creates a significant smell problem. The wind direction exacerbates the problem at times. One of the airport managers has direct contact with the Environment Agency on this subject and complainants are asked to channel comments through him. The Agency can do nothing unless it receives statements giving dates, times and other relevant data. Everyone affected agreed to co-ordinate complaints. One of the Broadstone people continued the theme of night flying noise mainly from mail flights. The challenges were phrased differently this time, but he was rebuffed as at previous meetings. He used turn distances and altitudes from the airport to support his case and it was shown he had his facts wrong. One of the aircraft used on these operations is scheduled to be replaced in the foreseeable future. Its successor will be quieter. One matter on which the airport has no control is police helicopter activity. The surveillance craft is based at Winfrith and most of its work is in the Bournemouth and Poole conurbation. This craft will be based permanently at Bournemouth soon so some disturbance will become standard. The move is a cost cutting measure as half of flying time now is getting from Winfrith to the scene of action. The airport has a new management team with the last member due to start work soon. All airports in the MAG group are now independent business units. 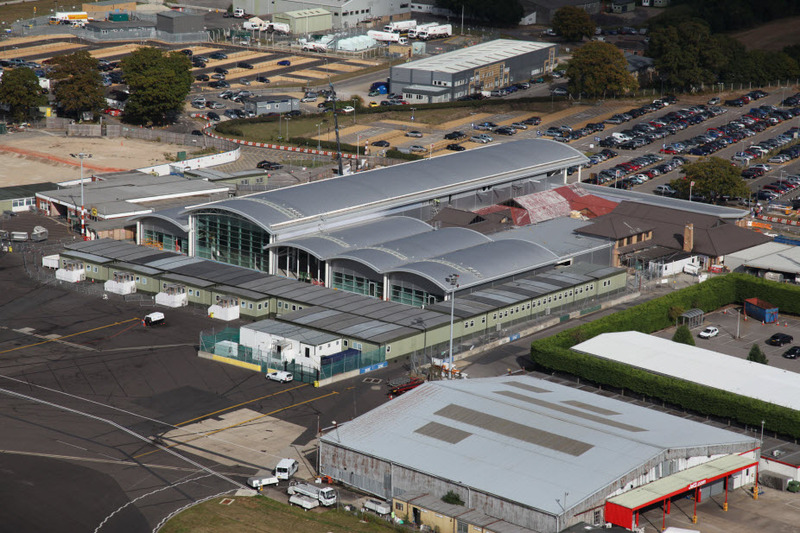 Previously Bournemouth was one of three airports clustered into a sub group where some management and development work was handled at another airport. Everything is now controlled on site. The new team is working on flight development to include long haul regulars, more European destinations and UK business flights (morning out, evening home) using 20 seat aircraft for centres such as Manchester, Leeds and Scotland. The new road layout on the B3073 was considered. Travelling from Parley Cross the lane markings are not as wanted by the airport. The inside lane should be to turn left into the airport, the middle lane for through traffic with the outer lane for right turns into Hurn Court Road. These markings were not implemented by Dorset Highways. The committee’s technical representative compiled valuable statistics over a long period. These were used to modify flight paths in order to reduce any disturbance to residents over the conurbation. Community complaints about flying patterns continue to be dominated by one person, a woman living in Northbourne. She lodged 125 complaints in the final four months of 2010. The land north of the business park is an SSSI and the airport is looking at ways of opening it to the community for recreation. The business park is now served by the airport bus service and a major development planning application is pending. Apparently, the airport created a substantial recycling facility by agreement with DCC only for the latter subsequently to announce that they did not want it (along with the three waste plants they were originally intending to get us tax payers to fund). The council should be made to compensate for its incompetence. A new passenger drop off charge of £2.50 had been announced the day before the meeting, replacing the current 10 minute free stay period. The charge starts on 17 April 2011. Partly it is to raise funds for on-going development rather than to boost profits and partly for environmental and safety reasons. When the cost of flying and the holiday or business expenses are considered the airport believes that this new parking charge will pale into insignificance. Drop offs in the access road cause pollution with engines left idling and they block the path of other vehicles. Manoeuvres by drivers to leave without going through the car park have caused a number of incidents. Large signs will be erected on Parley Lane to tell drivers of the charge, which will be levied for entry into the access road where a new road layout will make it impossible to park, reverse or turn. Everyone will have to go through the car park and pay the £2.50 fee. We suspect we may see drop-offs occurring on the B3073. At a presentation given at our public meeting of 24th February a representative of the airport gave details of the current situation and outlined plans for the future. The redevelopment plan remains on schedule despite the very difficult financial operating environment. The airport and associated business plant now account for an estimated 3,500 direct and contingent local jobs that contribute £300 million to the local economy. Many airlines are moving the centre of their operations away from airports like Bournemouth to take advantage of the weaker competition to be found in Europe. The airport would like to counter this by expanding its business flights to the major UK business centres and in particular Manchester. It is not considering any increase in the level of night-time flights. The Government aviation tax is distorting the economics of long haul travel. To fly from the UK to Sydney, Australia costs around £750 of which £400 is aviation tax. It is far cheaper to fly from the UK to a European hub, thereby paying tax on a small fare, and then to fly from the hub (Amsterdam say) to Australia and avoid a large slice of tax. The airport management are thus actively looking for a link to such a European hub.